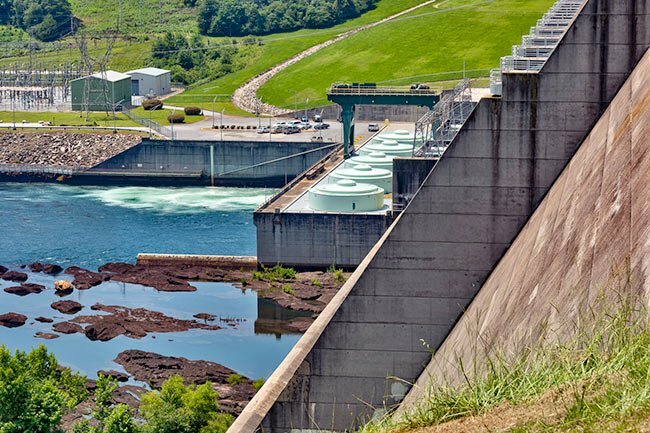 Lake Hartwell is a man-made reservoir created by the Hartwell Dam on the Savannah River. At 56,000 acres, its 962 miles of shoreline cover portions of both South Carolina and Georgia. 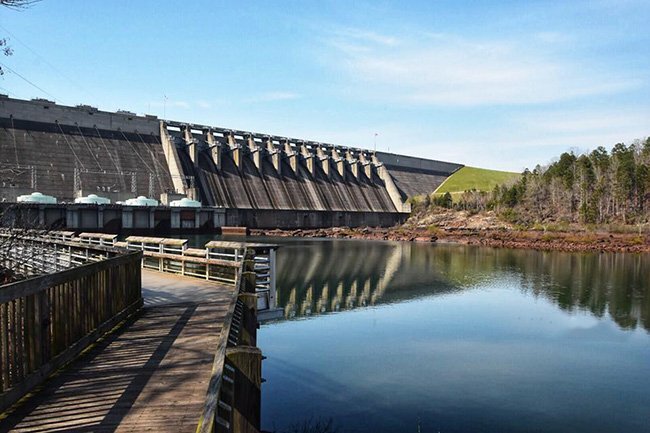 It was completed in 1962 as a project of the United States Army Corps of Engineers and is one of the region’s largest man-made lakes. The original design for the lake would have flooded Memorial Stadium at neighboring Clemson University. The school protested the plan, and eventually two diversion dams were built to redirect the Seneca River, which feeds the lake, and thus the beloved football stadium was spared. 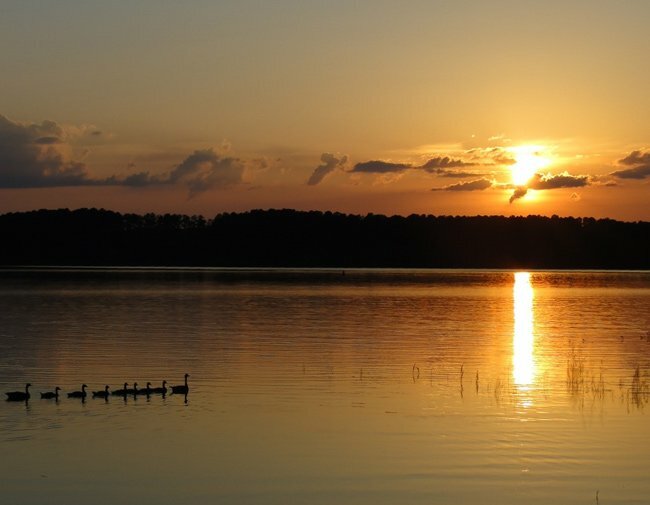 In South Carolina, Lake Hartwell spans Oconee County, Pickens County, and Anderson County. The lake is a popular recreation spot for fishermen due to the many varieties of fish that swim in its smooth waters. It is named for Nancy Hart, a Revolutionary War figure and native of adjacent Georgia. She is best known for capturing around six Loyalist soldiers who came to her backcountry Georgia home looking for a meal. She shot and killed two men, holding the others captive until her husband and neighbors arrived. As the legend goes, the local men hanged the Loyalists on a tree near the home as per Nancy Hart’s orders. In 1912, workers building a railroad less than a mile from the former Hart house discovered the remains of six or so men buried alongside each other, all with their necks broken. 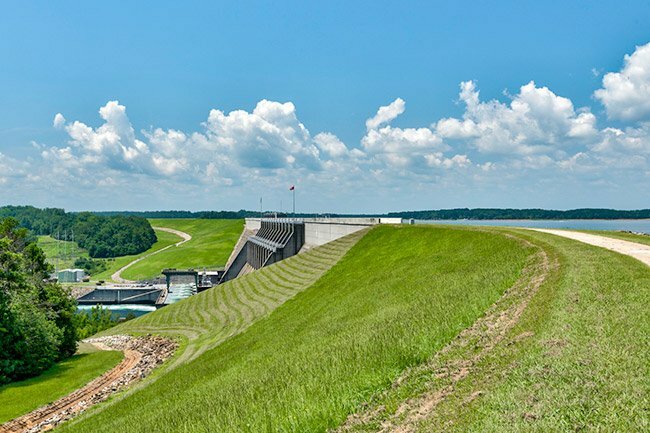 Hartwell Dam is described by the United States Army Corps of Engineers as “a concrete-gravity structure flanked on both sides by embankments of compacted earth. The concrete section is 1,900 feet long and rises 204 feet above the riverbed at its highest point. The earthen embankments on each side of the dam lengthen it to over three miles.” The photographer, William L. Nickles, described how the curvature of the dam made it difficult for photographs to convey its true length from any position. He went on to say that this wide-angle view shows only about two thirds of the dam. On the opposite side of the dam, is an old steel bridge. 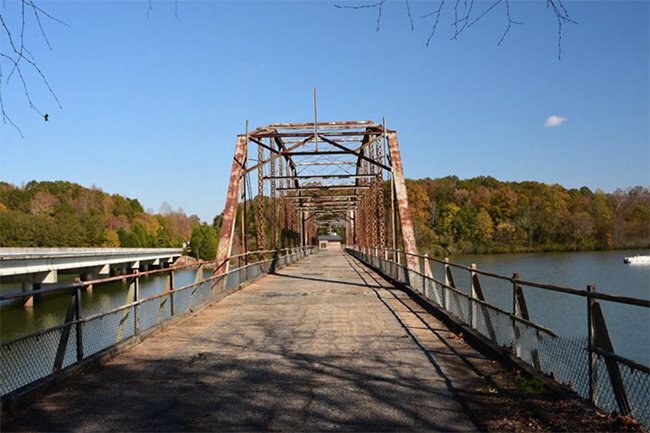 Once a bridge that supported vehicular traffic, it has been closed of to automobiles and is now a popular place to take in the sights of the area and to fish. 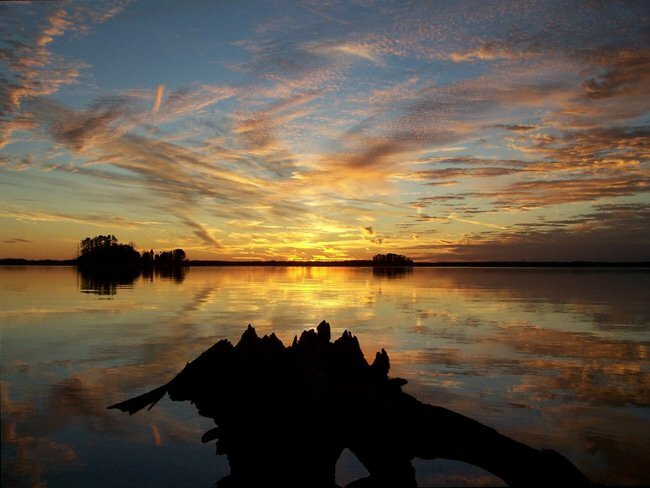 Coneross Campground is located along the Seneca River on the northern part of Lake Hartwell. It offers 105 camp sites, 12 of which are primitive. Campers at Coneross have access to a boat ramp and courtesy dock for fishing, swimming, or just taking in the lake view. 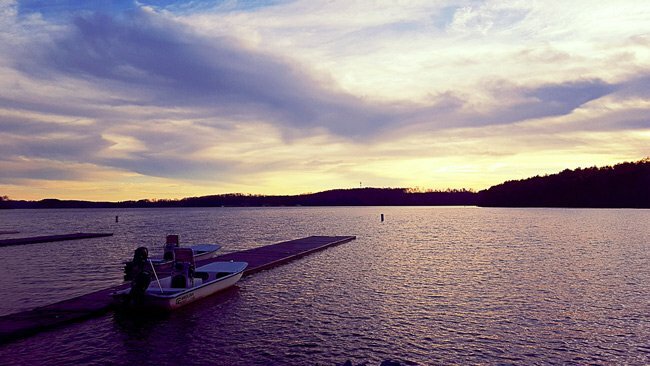 The below scene was taken from the boathouse at nearby Clemson University. The school’s rowing team practices on the picturesque lake, and an 11,500-square-foot training facility overlooks the water. The lake hosts a six-lane, 200-meter race course for the rowing team. 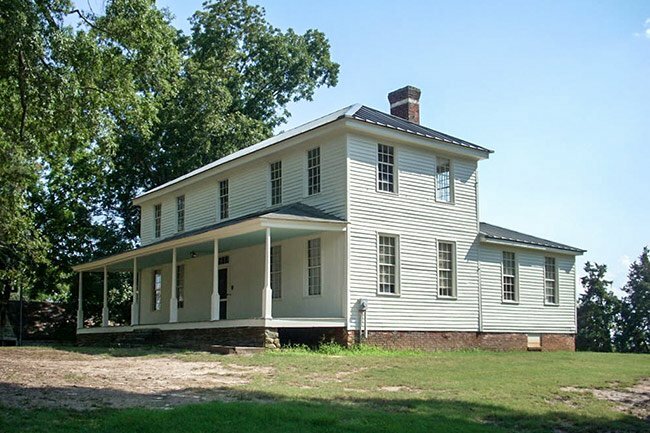 Tucked in a corner of Clemson University’s campus, on the banks of Lake Hartwell, sits Hopewell House, built circa 1785. Originally a frontier log cabin, the structure was substantially enlarged over the years. Hopewell’s most notable resident was Revolutionary War hero Andrew Pickens. Pickens is well regarded for his contributions during the Revolutionary War as a general in the Battle of Cowpens. He is also remembered for his peaceful negotiations with South Carolina Native Americans, including the Cherokees, Chickasaws, Chickamaugas, Choctaws, and Creeks. 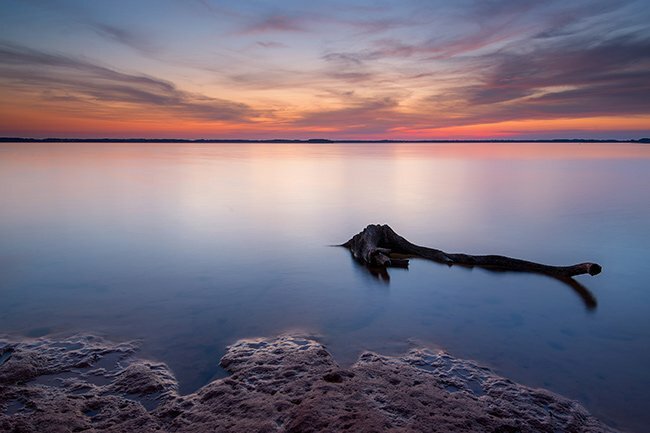 Lake Hartwell is so peaceful, and this picture puts stress to sleep!